Do you enjoy crime fiction? If so, do you subscribe to the Crime Readers’ Association? If not, I’m sure you’d find it worth your while – and it is free. The CRA is the readers’ arm of the Crime Writers’ Association (of which, by the way, I am once again Membership Secretary). Subscribers receive a bi-monthly edition of an entertaining online magazine, Case Files, along with all kinds of interesting features and articles from CWA members. In addition, subscribers receive a monthly newsletter containing updates of special events, crime reading (and writing) opportunities, book launches, author insider news, competitions and giveaways. 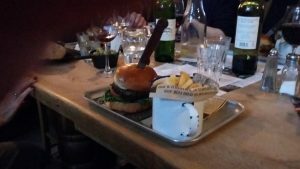 The members of the CWA are a convivial lot, often to be found propping up a bar somewhere, and none more so than the committee members, who had their Christmas lunch early in December. 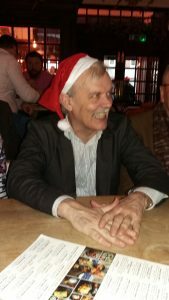 There was only one Santa hat, so of course it had to be worn by our highly esteemed chair, Martin Edwards. My neighbour’s Rudolph burger (actually beef, I believe) came – most appropriately – with a dagger already plunged into its heart. Kate Jackson, a fellow crime fiction aficionado, who blogs at https://crossexaminingcrime.wordpress.com, has started a splendid new venture, Coffee and Crime, a book box subscription service that you can receive as a one-off or monthly. 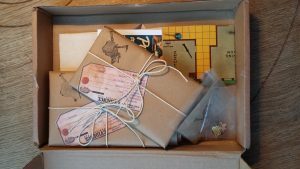 Each box contains two surprise vintage mystery novels, related goodies, such as notebooks, tote bags, coasters, a sachet of coffee, and a newsletter. After seeing the book box reviewed by Moira at Clothes in Books, I just had to order one. This is what I saw when I opened my box yesterday and what a treat it was, so beautifully presented and with such intriguing contents. My books were Phoebe Atwood Taylor’s Figure Away (An Asey Mayo Mystery) and Mary Roberts Rinehart’s The Door. I hadn’t read either of them – in fact I haven’t read anything by either writer and I am looking forward to trying them. (You can tip Kate off about which writers you already have plenty of). It is a terrific idea and I hope it is a great success. I shall be taking out a subscription.